The drawing and original beside each other during shading. Size: 13 in. × 10 in. 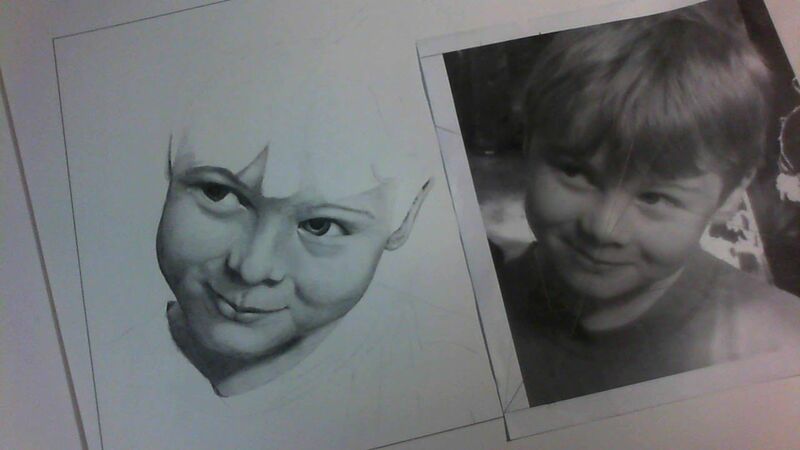 As a first portrait in drawing class, I elected to draw my brother. 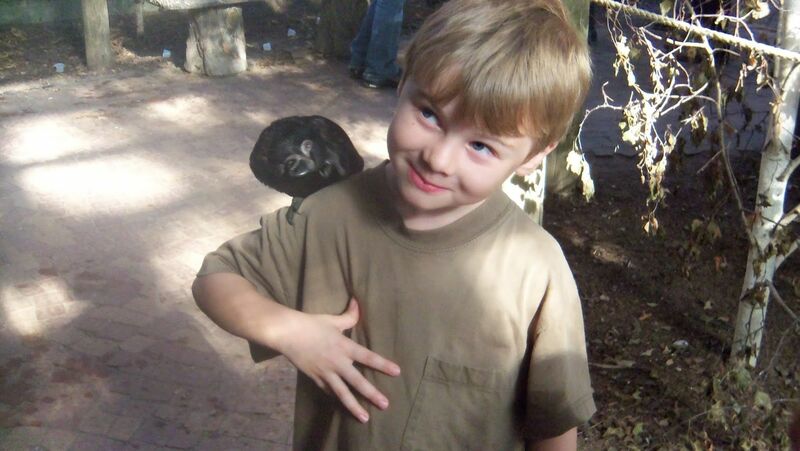 Browsing through my pictures, a cute picture of him holding a bird on his arm at the zoo aviary seemed best suited to my purpose. 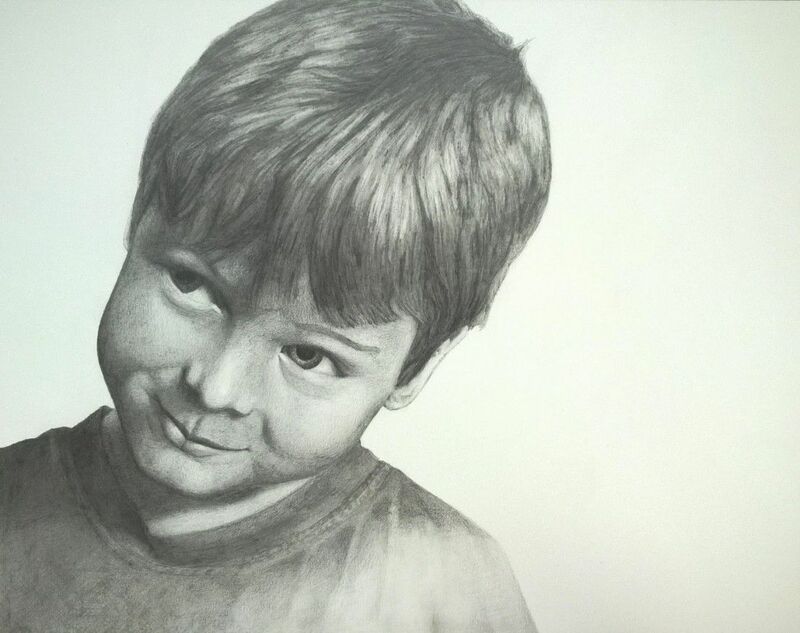 The result was exciting for me – no doubt my best portrait drawing until then. My favourite feature is the hair. Originally stressful to create, it seemed rendered in an enjoyable style once completed. However – art needing mastery – although very cute, this portrait was not the most successful academically. My method of drawing rays towards the chin to determine proportions was no doubt inaccurate, as it stretched the face upwards. The teacher also marked that the right eyebrow and the mouth should have been softer and lighter. My grade was B+ – good, yet a little disappointing for me as it prevented me from maintaining an all-A class score. Unless otherwise mentioned, this webpage and its content is licensed under the Attribution 4.0 International license. You may quote and copy this material if you give correct credit to the author and do not distort or otherwise change the original meaning of his words. Copying any material on this website without giving correct credit to the author is both plagiarism and copyright infringment, and will be treated as such. Denis G. Labrecque published this document on November 23, 2015. Proudly hosted on GitHub using Jekyll markdown.